2. ) “Like” NeopetsFanatic.com on Facebook (by clicking the Facebook “Like” button on the right sidebar of this page). 3. ) 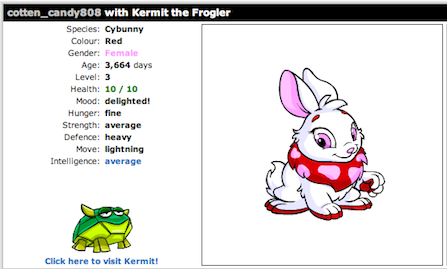 Post your Neopets username in a comment below (I need your username to send you the Cybunny if you win!) I will also be checking your shop to make sure you put up the required text. If you want to customize the text a little, you can, as long as you keep the site name and details the same. After doing these 3 easy steps, you’ll be in the draw to win my Cybunny! Make sure you have 1 pet space available (you cannot have over 4 pets, so make sure you have 3 pets maximum). The winner will be chosen at random–it could very well be you! Your future pet! A red Cybunny! 14 Responses to Win a Free Cybunny! *crosses fingers* Hope i get it, just LOVE bunnies of all kinds. btw when will you draw? I just made my new account so I have to wait 24 hours to post the content into my shop. I hope that’s okay! 🙂 Hope I get it!!! !